With a history tracing back 1,500 years, Kiev is incredibly multifaceted; going from bohemian to Soviet or medieval at a moment’s notice. There is much to discover and learn in this fascinating city, so read on for our guide to the top 10 things to see and do in Kiev. An important center of Eastern Orthodox Christianity since its foundation in 1051, the Kiev Pechersk Lava is a historic monastery and probably Ukraine’s most famous monument. It attracts millions of visitors — tourists and pilgrims alike — every year. It contains a large number of architectural monuments (including the Great Bell Tower, one of the most remarkable elements of Kiev’s skyline) and the Dormition Cathedral, completed in 1075 but destroyed during World War II and then rebuilt. The most incredible part is the large network of underground caverns and corridors, apparently built around the cave in which Saint Anthony of Kiev settled in the 11th century. Many saints were subsequently buried in those caves. Note that women have to cover their head to enter the Lavra. With its wealth of restaurants, Kiev is a great place to sample Ukrainian cuisine at any price. For budget-minded travelers, popular local chain Puzata Hata offers simple but traditional Ukrainian dishes at an incredibly low price, allowing everyone to discover the chicken Kiev and borscht without breaking the bank. In the same vein, check out Varenichnaya Katyusha, which specializes in dumplings known as vareniki. In general, every restaurant will serve a selection of Ukrainian soups, even pizzerias or sushi bars. So don’t be afraid to experiment and find a new favourite. Khreshchatyk is Kiev’s main artery, a large avenue stretching 1.2 kilometres (700 feet) from the northeast to the southwest and crossing the famous Maidan Square. To strollers’ delight, it turns into a giant pedestrian street on the weekend. It was completely destroyed by retreating Red Army troops during World War II and rebuilt in Stalinist style, but it retains an incredible beauty. There are many points of interest along Khreshchatyk — an indoor market, the city council, Maidan Nezalezhnosti and the People’s Friendship Arch, which is a huge Soviet monument dedicated to the unification of Russia and Ukraine in 1654. When Ivan Meller designed an arsenal in Kiev to support Empress Catherine II’s war effort, he said that he had built it not for weapons but for the people. Three centuries later, though the building has allegedly been used as a secret military base in the Soviet era, his vision has finally come true, thanks to the creation in 2010 of the Mystetskyi National Art and Culture Museum. The museum currently features a permanent collection of Ukrainian art, temporary exhibitions, concerts, lectures and a library, making it a cultural hub. The Holodomor, a man-made famine that killed 2.5-7 million Ukrainians in 1932 and 1933, was a horrific page in Ukrainian history but is seldom mentioned in the West. Although there is significant controversy over whether it was deliberate and how many victims there were, it is important to learn about it, if only to better grasp what Ukraine has gone through in the 20th century. 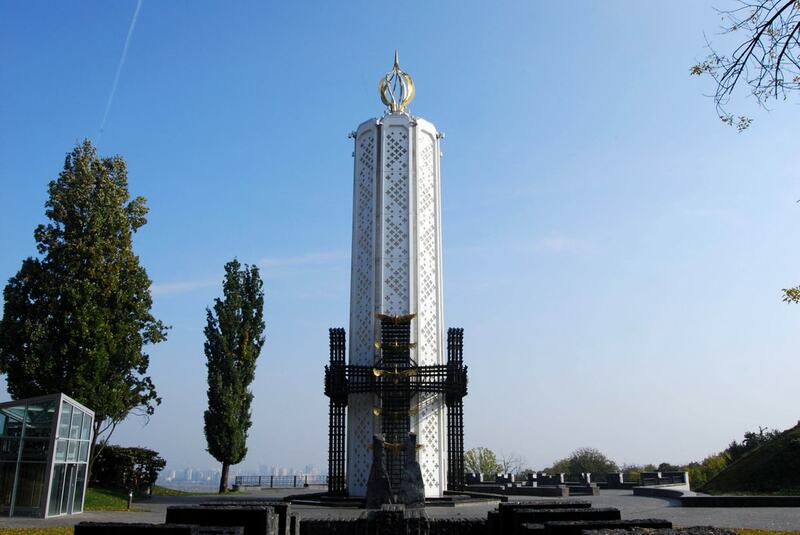 To this end, head to the Holodomor Memorial Museum, opened in 2008 in the park next to the Kiev Pechers Lavra. It’s quite small, consisting of only one room, but extremely moving. The Pinchuk Art Center is an international forefront for contemporary art, dedicated to showcasing outstanding new productions and artists. It also makes them accessible to the general public since admission is free. There is no permanent collection but rather temporary exhibitions, always ensuring something new and exciting to see. Artists who have exhibited their work range from major figures like Damien Hirst, Jeff Koons and Olafur Eliasson, to new talents like the shortlisted laureates of the 2011 PitchukArtCentre Prize. As a bonus, visit the bathrooms for a surprisingly disorientating experience. 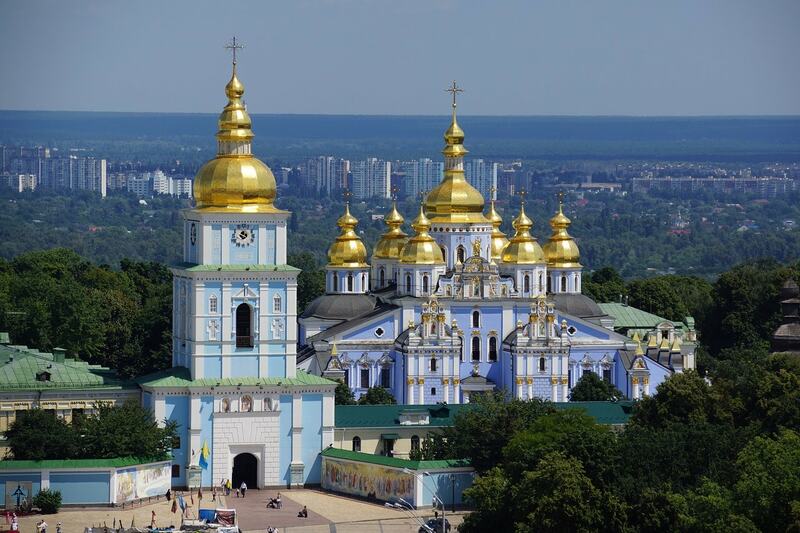 An ancient monastery is one of the main attractions in Kiev. There is a spiritual school, a church choir and also a special hotel, where pilgrims can stay for a while in the shrine. The cathedral stands on the edge of the Starokiev Mountain, not far from the St. Andrew’s Church. 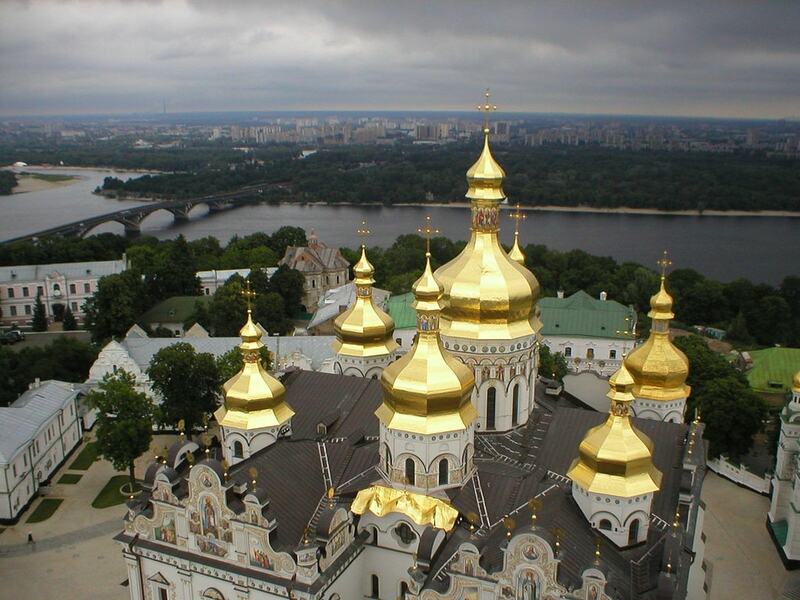 When it was built, the dome was gilded for the first time in Kievan Rus. For this reason, it has received the title of Golden-Domed. St. Michael’s Monastery was completely destroyed in 1935 and was restored only 60 years later. There are two botanical gardens in Kiev, but the Hryshko Botanical Garden is undeniably the better one. It’s a real oasis of peace in the heart of a huge, bustling city. Gorgeous greenery stretches far into the distance, bordered on one side by views of the Dnipro River and of the Left Bank. It also boasts over 13,000 different kinds of trees, flowers and other plants from all over the world. The best time of the year is spring, when the blooming flowers dazzle the visitors with vibrant colours and fragrances. 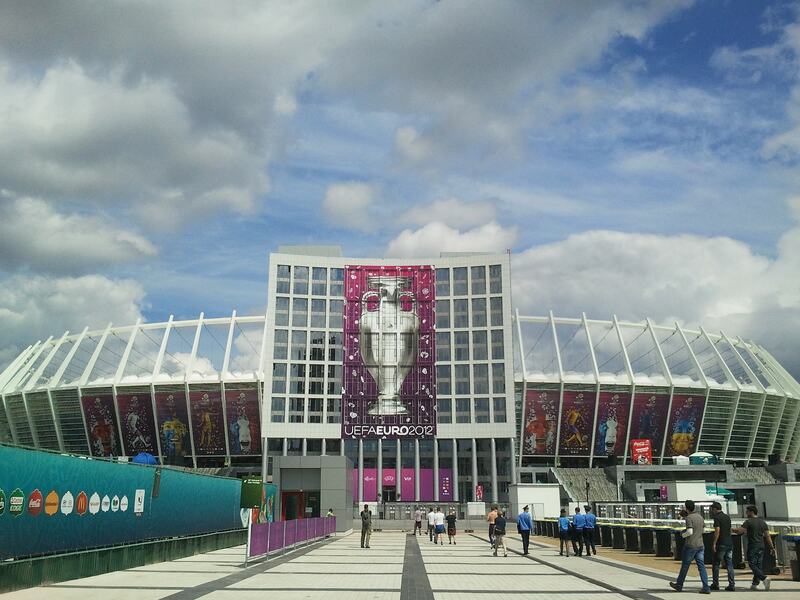 The Olympic Stadium serves as a home stadium for FC Dynamo Kyiv, Ukraine’s most popular football club. Crowds go wild for them. The nearest metro stop often has to close, and anyone taking public transport after a Dynamo victory will experience elated supporters jumping and chanting the club’s name. The atmosphere at one of their matches is incredible though, even if you’re not much of a football fan. With tickets surprisingly cheap, it’s a great way to catch a glimpse of the ‘real’, off-the-beaten-track Ukraine, and enjoy a quality sporting event. Street food festival in Kiev has become the local’s favourite venue a long time ago. Every month on the Art-Zavod Platforma (creative and co-working cluster) there is a food celebration dedicated to the cuisine and culture of the particular country. Being animal-friendly, there’s always an opportunity to come with the pet or even to join the flash mob as Pug Team Kiev. Moreover, people come to listen to the DJ’s or Ukrainian singers, who perform in the evening, dance the night away or meet with friends.